Mary Lou Rife has been teaching women the art of expression in Calvary’s Life Skills, Education and Arts Program (LEAP) for almost one year. 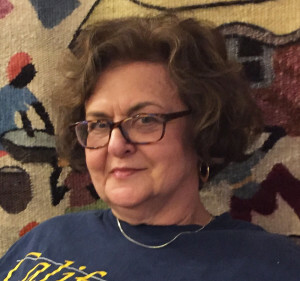 She currently teaches a poetry class called “Women’s Voices around the World.” She first learned about Calvary through a good friend, Nancy Arbuthnot, who has also been featured on the blog. Mary Lou says, “I would encourage others to get involved not only to share their capabilities, but to experience the impact you can have in increasing women’s knowledge, skills and confidence, which spills over into other areas of their lives.” We thank Mary Lou for encouraging women to explore new avenues of expression through her classes! I enjoy working more closely with women than I had volunteering at other places where I served food and was able to chitchat with men and women. At Calvary, I get to share poems I love and encourage women to tell their stories and express themselves honestly on paper. I feel that I get to know them on a more personal level and appreciate the success they have in overcoming homelessness and other life challenges. I am impressed by the level of support the women offer each other as they read their own poems, knowing that the process has made many of them vulnerable. What I like most about my work with Calvary is experiencing the women’s sense of pride in writing a poem, and their satisfaction that they can create art. Many have not done so before. I enjoy exposing them to poetry they may have not read, watching them analyze it and then writing on a similar topic. I’ve had a couple of memorable experiences listening to poems that women have read and realizing that they could be published; that they are truly great and need to be seen by a broader community. I have been continually surprised by the gifts these women have – talents that are uncovered as they speak, from knitting to playing musical instruments; their insight about their experiences and character; their generosity in supporting other. I see all of this in their writing and discussion in classes.